Having fast and filling snacks available throughout the day is key to health and weight-loss or maintenance. But meals are the most important time for the whole family to develop a shared cuisine that is satisfying and nourishing. With each new generation of adults it seems like the practical life skill of cooking is seen less and less as a necessity. Processed ready-to-eat foods have completely replaced the homemade in some households. Giving up on cooking has allowed folks to fill their schedules with countless other activities, so the cycle becomes self-perpetuating: people become incredibly busy and no longer have time to cook even if they want to. I believe there are few things in life more important than how we eat. Eating habits are HUGELY tied to our health and the quality of our lives, and no one can be truly happy when they feel sick. So no matter how many extra hours of work you can fit in to your schedule at the expense of a good diet, you will pay a far greater price than what shows up on your timecard. But hey, I GET busy. I know when you have a mile-long to-do list and a screaming kid on your hip you just can’t drop everything and start a mirepoix. But since the dawn of humanity our species has been trying to find ways to preserve food and free ourselves from the constant threat of spoilage and starvation, so you can reap the rewards of one technology born from that goal, the freezer! There are some excellent healthy recipes that take well to freezing; I’ve included three below to get you started. Just cook a big batch when you have time (a slower weekend, cooking day with your kids, when you’re already cooking a dinner and can just increase amount) and then portion it out to store. I freeze mine in casserole dishes so they can go straight into the oven in the late afternoon-early evening and be ready by dinner time. Got more great freezer-friendly dishes? Link them in the comments below! *A note on containers to freeze foods in… At the risk of overwhelming readers who are newer to the challenge of healthy living in modern America, I feel I should mention that most plastic containers and baggies contain Bisphenol-A (the infamous cancer-causing BPA) that is released into food when it undergoes extreme temperatures, such as microwaving or FREEZING. To avoid this chemical contamination, I buy my BPA free plastic baggies at Whole Foods and use glass containers to store food (Snapware, Anchor, Pyrex). This lasagna can easily be made with ground meat, different sauce, etc. For a pre-made marinara I like WF 365 Classic pasta sauce. Tastes like Prego but with decidedly more quality ingredients, and at $2.69 it’s not terribly pricey. For this veg version I like the Cibo Naturals pesto sold at Costco. Any veg in your fridge that cooks well can be used, but I usually go with zucchini, broccoli, asparagus and organic spinach. The noodles could be whole grain or gluten-free, or can be replaced with strips of roasted eggplant or zucchini. 4. Stir 1 cup julienned sundried tomatoes and 3/4 cup pesto sauce into diced veg and mix well. Adjust proportions and add salt and pepper to taste. I also like to add some Ricotta to the mix from time to time. 5. 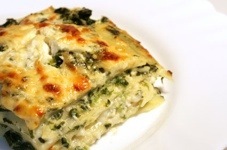 Add a layer of pesto sauce to bottom of dishes, then layer noodles, veg mix, and mozzarella for 2-3 layers. 6. Top with mozzarella, Parmesan, and drizzled olive oil. Cover and freeze! On the day you plan to serve, take it out in morning to let it defrost during the day. Then bake at 350 for 45 minutes or so until all the cheese is bubbly. Uncovering for last 10 minutes will get cheese on top extra bubbly. This is a freezer-friendly leftover chicken recipe, something I yearn for! Although I have been a vegetarian for over 1/3 of my life, I have relished the simplicity of making roasted whole chicken for my family from time to time. But when you’re buying an $18 organic humanely and sustainably raised bird, you really want to get all you can out of it. So I diligently remove every bit of extra meat after our meal and turn it into this spicy casserole that can be eaten days or weeks later. 4. Spread layer of enchilada sauce in bottom of casserole dish. Coat a corn tortilla with sauce, spoon in chicken/cheese mixture, roll and place in pan. Fill dish with rolled tortillas, top with more sauce, shredded cheese, and scallions. Freeze and cook just like the lasagna. This almost-vegan recipe (just skip the butter) is a total crowd pleaser because it’s so hearty and savory. It does take a bit of forethought because the beans should soak, but if you remember that part the rest is pretty easy. I use WF thirteen bean mix from their bulk department. And if you’ve never tried their Organic Gourmet bouillon, PLEASE do! Amazing! 2. In the morning, drain beans, rinse thoroughly until water looks clean, and start boiling them in 4 cups of water. Add two cans of diced tomatoes and 6 bay leaves and simmer. 4. Chop 3 stalks celery, 3 carrots, and 1/2 large onion and cook in butter until tender. Add 2 cloves minced garlic at end of cooking so it doesn’t brown. Scoop veg mixture into soup, deglaze butter with some broth and also add to soup. 5. Add broth or bouillon to desired thickness and let it simmer as long as possible! Taste this soup often and adjust bouillon, veg and spices to your preference. Freeze cooled soup in glass container with tight-fitting lid, defrost and heat in pot to serve. Imagine a freezer stocked with these meals. Imagine serving your family a gourmet tasting, good feeling, healthy home-cooked meal on a weekday just by heating something up. With some planning, it is possible…and very enjoyable! So set a date and start cooking!